"Electronegativity is the power of an atom when in a molecule to attract eletrons to itself." The electronegativity will depend upon a number of factors including other atoms in the molecule, the number of atoms coordinated to it, and the oxidation number for the atom. There are a number of ways to produce a set of numbers which represent electronegativity scales. The Pauling scale is perhaps the most famous. in which E(AB) is expressed in kJ mol-1 (1 electron volt, 1eV, = 96.48 kJ mol-1) and ΧA - ΧB represents the difference in "electronegativity" between the two elements, whose individual electronegativities are given the symbols ΧA and Χ. Using this equation, Pauling found that the largest electronegativity difference was between Cs and F. Pauling set F arbitrarily at 4.0 (today, the value for F is set to 3.98) and this gives a scale in which the values for all other elements are less than 4 but still with a positive number. 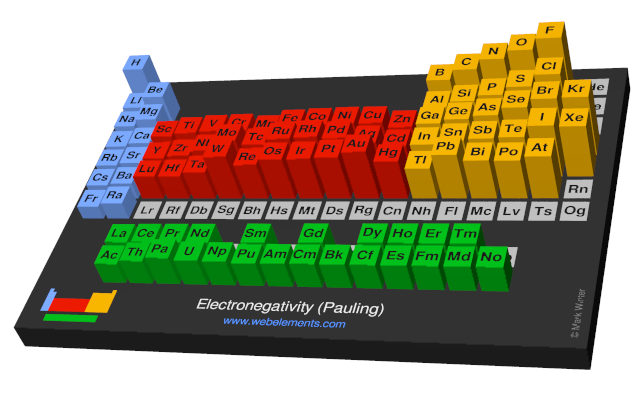 Image showing periodicity of the chemical elements for electronegativity (Pauling) in a periodic table cityscape style. 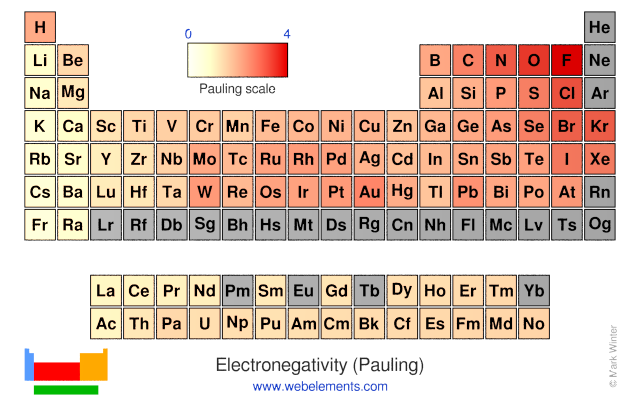 Image showing periodicity of the chemical elements for electronegativity (Pauling) in a periodic table heatscape style. 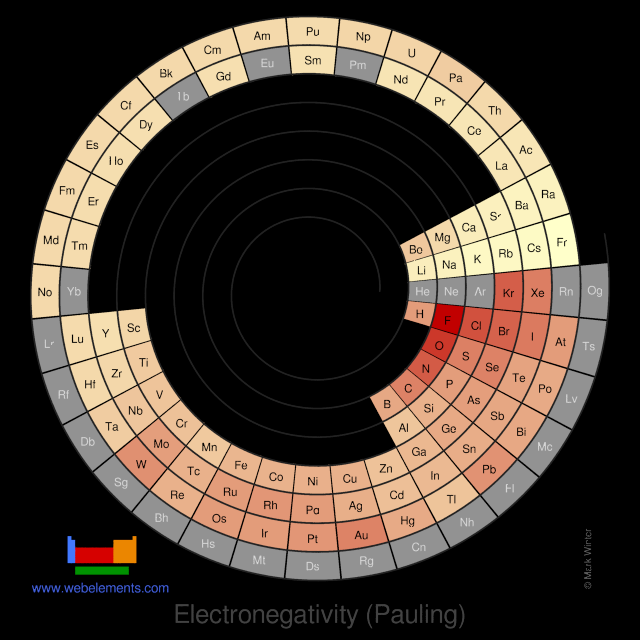 Image showing periodicity of the chemical elements for electronegativity (Pauling) in a spiral periodic table heatscape style. 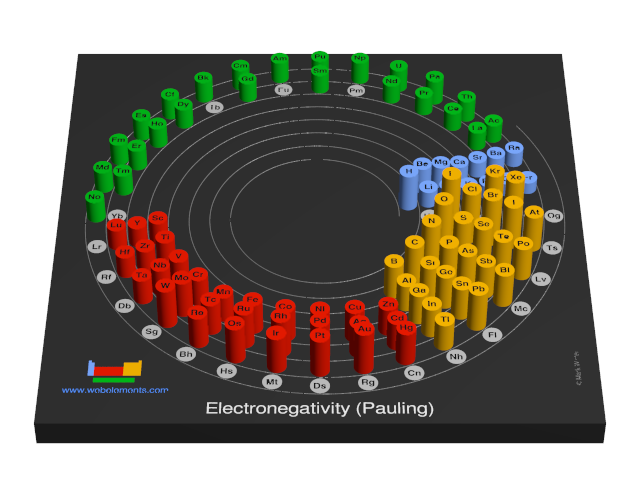 Image showing periodicity of the chemical elements for electronegativity (Pauling) in a 3D spiral periodic table column style. Image showing periodicity of the chemical elements for electronegativity (Pauling) in a 3D periodic table column style. Most values are taken from reference 1 and where values are missing from reference 2. Values for Group 18 elements and for elements 95-102 are taken from reference 3. Pauling electronegativities are published in many sources and essentially identical data are to be found in references such as 4 and 5. A.L. Allred, J. Inorg. Nucl. Chem., 1961, 17, 215. L. Pauling, The Nature of the Chemical Bond, Cornell Univ., USA, 3rd ed., 1960.